CHELSEA are willing to use Eden Hazard in a swap deal to land Real Madrid star Gareth Bale. Hazard is a long-term target for the Spanish giants. The Belgium international was tipped to quit Stamford Bridge for Real last summer but the winger broke his ankle, ending any hope of a deal. And according to Spanish news outlet Don Balon, who often make outlandish transfer claims, Hazard is desperate to join Real this summer. 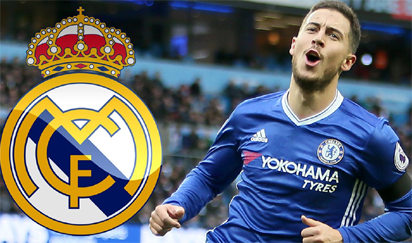 They say Hazard, 27, is determined to join Real, even if Zinedine Zidane isn’t in charge at the Bernabeu. Don Balon add that Chelsea have also proposed a swap deal involving Hazard and Real star Bale. The Blues are willing use their star man in a player-plus-cash deal, with Bale desperate to return to the Premier League. Hazard has impressed for Chelsea this time out, with the Blues having a hit-and-miss season under Antonio Conte. The Belgium ace has netted 15 goals and chipped in with six assists in all competitions this campaign. Speaking about his Stamford Bridge future earlier his year, Hazard said: “In football you never know. I’m happy at Chelsea, and focused on them. The post Chelsea propose Hazard ‘swap’ for Bale appeared first on Vanguard News.